1. Use 89C51/89S51 chip as the control kernel, and can be applied to students' projects. 2. Can be applied to a car back bumper distance checker, A good subject for the purpose of training programming skills and stimulating creativity. 3. It beeps when it is close to objects. The more closer it is, the more rapid the sound becomes. 4. Distance of buzzer warning is adjustable by tuning dip switches. The range is from 50 to 125 cm. 5. The transmission frequency of the ultrasonic transducer is 40KHz. 6. Operation range: 13 to 400 cm by default. The program can be modified to adjust the operation range. 7. Can attach one DS1821 temperature sensor to revise errors caused by the environment temperature, and also can act as a thermometer. 9. Recorded data can be reviewed by pushing UP & DOWN buttons. 10. 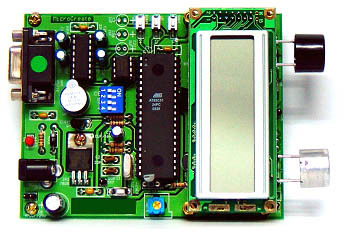 Current measured values can be transmitted to the computer via RS232. 11. Can use a 9V battery. The power consumption is about 60mA. 12. Preserve LCD back light power in order to be used under lightless conditions. 13. Distance measuring is influenced by the environment temperature.